Comment: Had a sprinkler link leak and had to remove about 2â x 10â in pavers from the side of my driveway. Need sprinkler line repaired as well as pavers put back in place. Comment: Need pavers installed in a driveway and into existing carport. Current driveway is gravel/crushed granite. Approximately 12' wide x 40' long. Comment: getting rid of carpeting and looking into flooring options. Considering staining but don't know how much it costs. Comment: New house, need front porch, walkway to driveway and possible driveway paved depending on cost. Phoenix Pavers Installation Group, Inc.
Phoenix Concrete Contractors are rated 4.79 out of 5 based on 1,025 reviews of 49 pros. 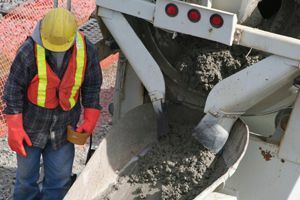 Not Looking for Concrete Contractors in Phoenix, AZ?